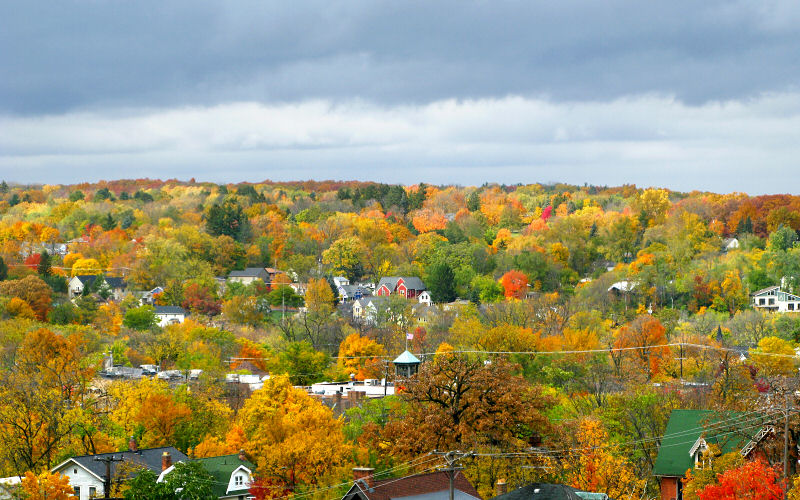 AutomotiveUI 2016 will take place in Ann Arbor, Michigan, a city the middle of the US (actually, the east middle, but people call it the midwest). The closest major airport is Detroit (DTW) which is actually half way between Detroit and Ann Arbor. 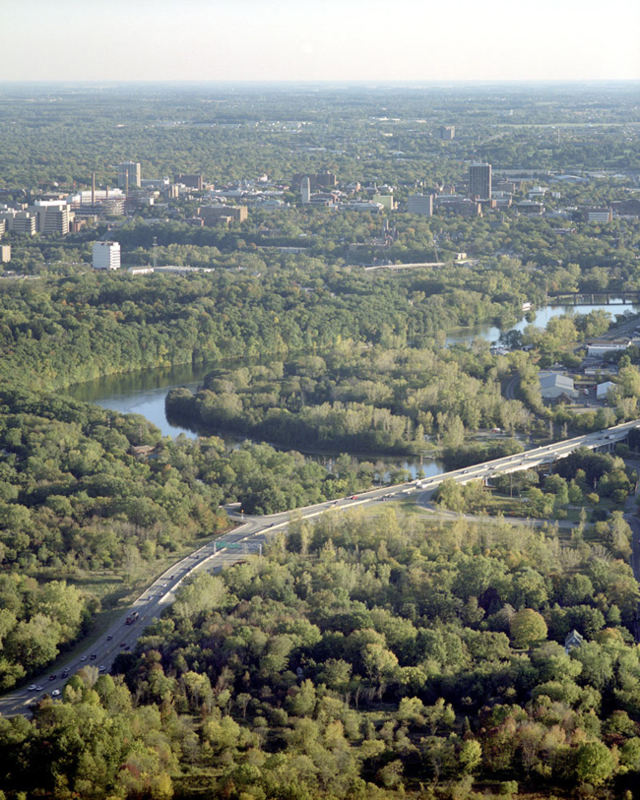 Ann Arbor is the home to the University of Michigan, the second largest university in the US in research revenue (in excess of 1 billion dollars). In contrast to Nottingham, last year’s venue, we do not have any historic castles because nobody ever invaded Ann Arbor. Our nickname is “tree town.” The school mascot is the wolverine, a ferocious but nearly extinct mammal. 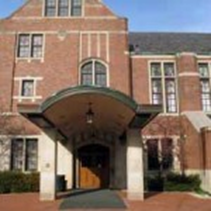 University of Michigan League on Central Campus. All papers, posters, exhibits, etc. are at the League, the conference venue. Most events are on the second floor of the League, for which a map is provided below. A few events are on the first or third floor. If you are not sure where to go, go to the concourse on the second floor and someone will direct you to the appropriate location. The maps for all floors will be printed in the conference program, but feel free to download them from the URLs above. From the north or south, take US-23. From the east, take I-94 or M-14. From the west, take I-94. Most likely, you will fly to the main Detroit airport, DTW (Detroit Wayne County airport) that is actually located in Romulus, Michigan, a town midway between Ann Arbor and Detroit. If you are flying from Europe, consider flying from Amsterdam. Detroit and Amsterdam are Delta hubs and there usually are three flights per day. There are many other options, some of which involve flying via Chicago (which is west of Ann Arbor). Hipmunk.com can provide some useful flight options. 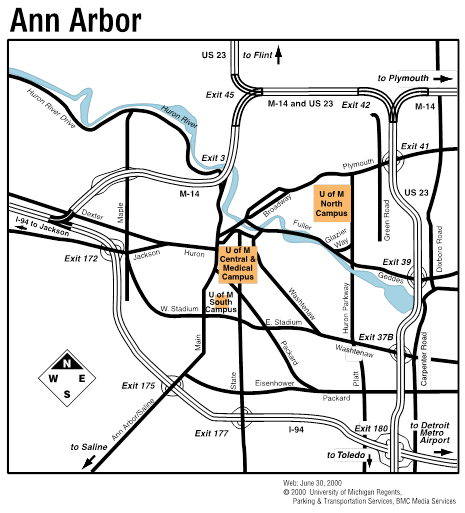 To get to Ann Arbor from the airport, you can (1) rent a car, (2) take a Supershuttle (which goes to most of the major hotels), or (3) take the AirRide, a bus that goes between downtown Ann Arbor, the Kensington Court hotel on the south side of town, and the airport. It is cheap ($12-15) and comfortable. From the airport, take I-94 west to US-23 north. To get to the city boundary from the airport should take less than 30 minutes. Depending on your destination and traffic, it will take and 8-15 minutes to get there. In general, everything inside US-23, I-94, and M-14 is Ann Arbor. The map below shows all the major streets and intersection numbers, which should be helpful for navigation. For those not from the US, an I road is an Interstate highway, a limited access high-speed roads (except for business routes). M roads are Michigan state roads. In this case, M-14 is a limited access road, as is US-23. Road with even numbers go east-west (generally) and roads with odd number go north-south. Exits are numbered from some point of origin, often a state border, and indicate the approximate mile distance from that point. So, on US-23, whose origin is the Michigan-Ohio border, exit 41 is two miles north of exit 39. 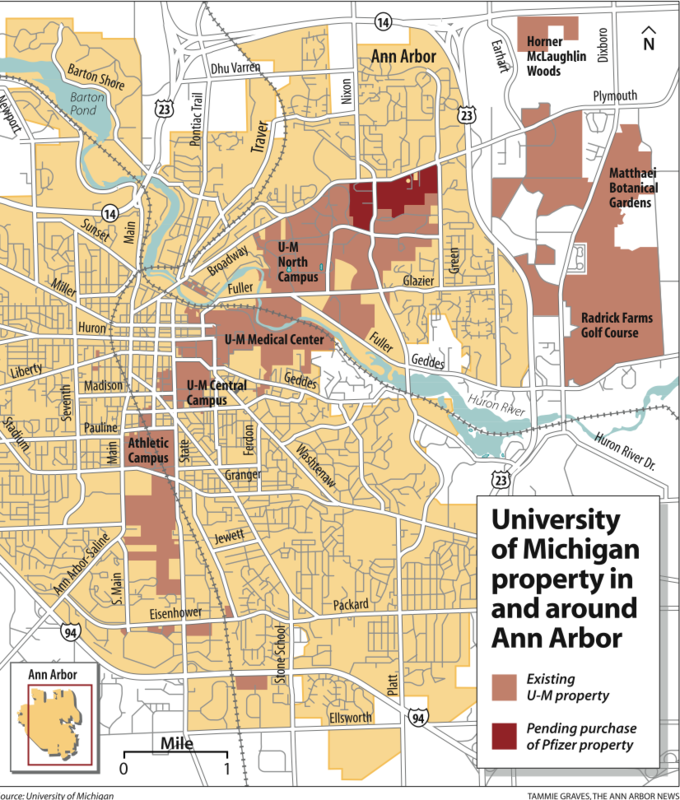 There are four adjoining campuses in Ann Arbor, North Campus (engineering, art and architecture, music and dance), the Medical campus (the hospital and medical labs), Central Campus (where programs not on north campus are located, e.g., liberal arts, sciences, public health, education), and the athletic campus (football, hockey, basketball, baseball, track, and tennis facilities). Central campus, where the conference venue is located, in the center of town. The university owns a huge amount of land. The straight-line distance from the Mobility Transformation Center on North Campus to the football stadium on the athletic campus is about 4 miles. The property shown as pending was purchased. 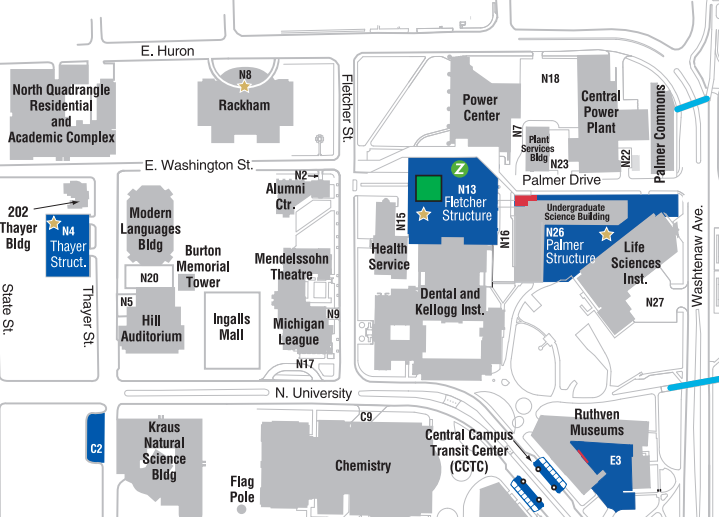 The center of central campus is formed by N. University, E. University, S. University, and State St. The League, the conference venue, is just north of that square as shown on the map after the one that follows. The small blue boxes are campus bus stops. The University has free bases that go around North Campus, and from North Campus to Central Campus, and another set of buses that go around Central Campus. Parking is not very good on central campus if you do not have a pass. The Fletcher, Palmer and Thayer structures are recommended in that order. If you are on campus by 8:30 am or so, parking will not be a problem. We are working on how to make it work. Hotels basically are in 3 groups: (1) close to the Michigan League in town, (2) on North Campus (at US-23 & Plymouth Road) and (3) on the south side of town near Briarwood Mall. There are also a few hotels in other places, such as the Regent Hotel off of Washtenaw Avenue (nice place, stay there if you need lumber – Home Depot is nearby) and some hotels on the far west side of town (e.g., Webers’ Inn). The League was selected as the conference venue before we had feedback on hotel room availability. The League has the space desired, provided food, and was in town, so attendees could get a feeling for campus. It is a great venue. We have been working closely with the Ann Arbor Convention and Visitors Bureau to get bids from hotels, and after some back and forth, got all the undesired clauses removed from the hotel contracts. Our original plan was to have most folks stay downtown, but we could not get enough rooms and the hotel with the most space, the Campus Inn, was just sold and is being remodeled. It will open in a few months as the Graduate Inn, and when it re-opens at the end of April, they will let us know about rooms. So, our recommendation is to stay downtown near the League or near Briarwood mall. We will provide buses to stop at specified Briarwood hotels. Nonetheless, you may wish to favor hotels that provide shuttle service. The table that follows lists the hotels we are recommending with the “rooms@rate” column indicating how many rooms they will grant us at the specified rate, but we may be able to get more. For most hotels, this is about 25% of their capacity. Note: Briarwood is a shopping mall south of town. There are many other fine hotels in Ann Arbor, with our initial list having 20, but we are focusing on a subset to simplify transportation and provide more opportunities for people to connect. The difference between hotels in Ann Arbor is how big the rooms are (none are tiny), if they provide breakfast (most do), if Wifi is free (mostly yes), if there is a fridge or microwave in the room (varies), and if a shuttle is provided (varies). If you plan to come to Ann Arbor before the conference to attend the football game, make your reservations immediately and expect to pay extra for room. Rooms in the Briarwood area can go for $300/night during a football weekend. Usually all hotels within 20 miles or so of Ann Arbor sell out many months in advance for that weekend, homecoming. You can get tickets on line now or wait to see if we are lucky and can get a block of tickets. Avoid the Embassy Hotel downtown, not to be confused with the Embassy Suites. Some say it is in the class of hotels that rent by the hour. Paul Green (pagreen(Replace this parenthesis with the @ sign)umich.edu,+1 734 763 3795).